Usual designation, among the Tosafists, of Rashi's commentary on the Talmud. Rashi himself uses the expression once to designate a written Talmudic interpretation by his "old teacher" (Jacob b. Yaḳar on Giṭ. viii. 82a). In the commentary on Ta'an. 21b, a "ḳonṭres of Rome" is mentioned, which elsewhere (commentary on Ker. 5a) is called "perush [commentary] of Rome" (see Berliner, "Beiträge zur Gesch. der Raschi-Commentare," p. 4). Rashi's Bible commentary likewise is termed "ḳonṭres" by himself and by his pupils (l.c. pp. 10, 19); in one place it is called (plural; l.c. p. 11). The word does not designate the commentary itself, but the note-book, or books, in which it was written. Rashi himself, in explaining the Talmudic word which designates the clasp (see Blau, "Buchwesen," p. 171) used to hold the leaves of a book in place, speaks of the "leaves of the ḳonṭres" ( ; commentary on Shab. 98a; Men. 32a). In the Yalḳuṭ to Ps. xlv. 5 (§ 746) an unwritten ḳonṭres is mentioned ( ); the source of the Yalḳuṭ (Midr. Teh., ed. Buber, p. 271) has (χάρτης). 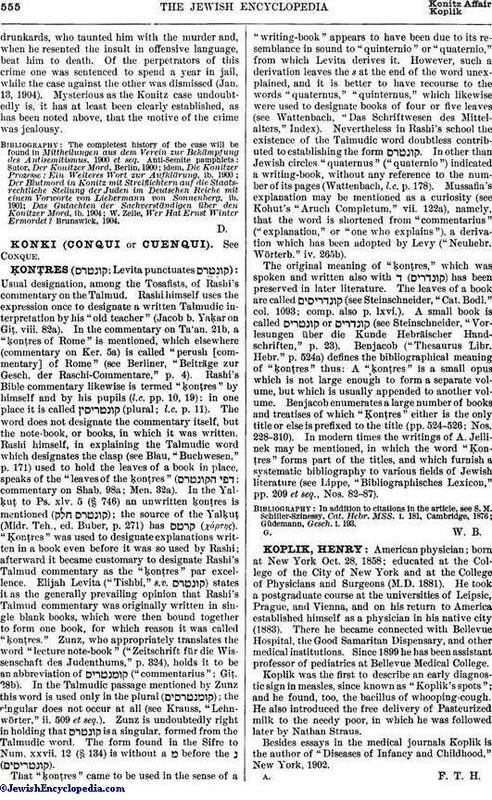 "Ḳonṭres" was used to designate explanations written in a book even before it was so used by Rashi; afterward it became customary to designate Rashi's Talmud commentary as the "ḳonṭres" par excellence. Elijah Levita ("Tishbi," s.v. ) states it as the generally prevailing opinion that Rashi's Talmud commentary was originally written in single blank books, which were then bound together to form one book, for which reason it was called "ḳonṭres." Zunz, who appropriately translates the word "lecture note-book" ("Zeitschrift für die Wissenschaft des Judenthums," p. 324), holds it to be an abbreviation of ("commentarius"; Giṭ. 28b). In the Talmudic passage mentioned by Zunz this word is used only in the plural ( ); the singular does not occur at all (see Krauss, "Lehnwörter," ii. 509 et seq.). Zunz is undoubtedly right in holding that is a singular, formed from the Talmudic word. The form found in the Sifre to Num. xxvii. 12 (§ 134) is without a מ before the נ ( ). That "ḳonṭres" came to be used in the sense of a "writing-book" appears to have been due to its resemblance in sound to "quinternio" or "quaternio," from which Levita derives it. However, such a derivation leaves the s at the end of the word unexplained, and it is better to have recourse to the words "quaternus," "quinternus," which likewise were used to designate books of four or five leaves (see Wattenbach, "Das Schriftwesen des Mittelalters," Index). Nevertheless in Rashi's school the existence of the Talmudic word doubtless contributed to establishing the form . In other than Jewish circles "quaternus" ("quaternio") indicated a writing-book, without any reference to the number of its pages (Wattenbach, l.c. p. 178). Mussafia's explanation may be mentioned as a curiosity (see Kohut's "Aruch Completum," vii. 122a), namely, that the word is shortened from "commentarius" ("explanation," or "one who explains"), a derivation which has been adopted by Levy ("Neuhebr. Wörterb." iv. 265b). The original meaning of "ḳonṭres," which was spoken and written also with ד ( ) has been preserved in later literature. The leaves of a book are called (see Steinschneider, "Cat. Bodl." col. 1093; comp. also p. lxvi.). A small book is called or (see Steinschneider, "Vorlesungen über die Kunde Hebräischer Handschriften," p. 23). Benjacob ("Thesaurus Libr. Hebr." p. 524a) defines the bibliographical meaning of "ḳonṭres" thus: A "ḳonṭres" is a small opus which is not large enough to form a separate volume, but which is usually appended to another volume. Benjacob enumerates a large number of books and treatises of which "Ḳonṭres" either is the only title or else is prefixed to the title (pp. 524-526; Nos. 228-310). In modern times the writings of A. Jellinek may be mentioned, in which the word "Ḳonṭres" forms part of the titles, and which furnish a systematic bibliography to various fields of Jewish literature (see Lippe, "Bibliographisches Lexicon," pp. 209 et seq., Nos. 82-87).